We’ve come into the dog days of winter, except you never hear winter referred to in that way, so what are the days of late winter? Cat days? Abominable Snowman days? Sasquatch days? Whatever they’re called, we’re in ‘em. It’s the phase of the year where you wake up every morning and lament, Nancy Kerrigan-style, “Why God? Whyyyyyyyyy?” Driving through the streets of Downtown Syracuse this past weekend, it seemed like the city was particularly bogged down by the precipitous Upstate NY weather. The streets, most unplowed, were encumbered by encroaching snowbanks, sidewalks remained un-shoveled, and yet more snow was falling out of the sky, all proud of itself, like the cat who ate the canary. Undaunted, we made our way to The Mission, a Mexican restaurant in an old church (get it, Mission?) I have passed many times and always wanted to stop by. After trudging through snowy streets and sidewalks to get in there, we certainly were ready for a South of the Border feast. And the first impression in The Mission is great. 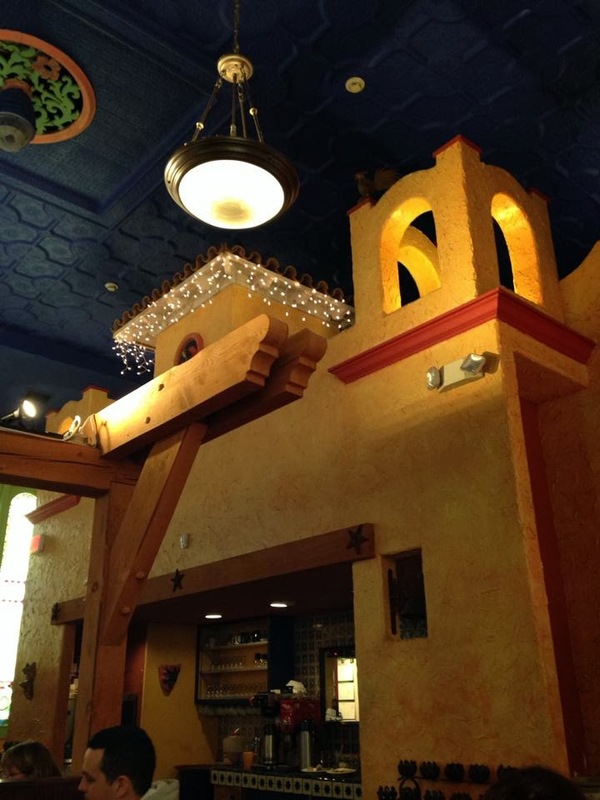 It’s a much smaller dining room than I had envisioned driving by, but it’s gorgeous – like the Mexico pavilion at Epcot Center, but about a tenth of the size. But I will say, I was freezing the entire time. Throw on an extra sweater before brunch here, or wait another month and a half. The people coming out of the kitchen were all wearing ski hats, and this is a 19th century building, so I’m assuming the heating system is not really up to staving off a 19 degree day. I will also say that while our waiter was friendly, he wasn’t the most attentive of chaps. He gave us recommendations, and chatted with us about the two beauty queens in cocktail dresses at our booth, but he always seemed distracted, and tended to flit off before we were really done with him on a couple occasions. He also brought my Dad refried beans, when he had ordered frijoles negros, which ended up being yummy, but not what he wanted. I had arrived intending to order off the brunch menu, either the migas or the sweet potato and chorizo hash. I love hash. Apparently, so do a lot of other Mission fans, because they were sold out of it. He gave us lunch menus as well, though, so I ended up with the Puerco Pibil burrito AKA shredded pork with orange and achiote. Achiote, or annatto, is a seed from a tree that grows in Mexico and the carribean that is chiefly used as a food colorant, to give Mexican food that gorgeous yellow/orange hue that looks so appetizing. The flavor is mild, but can be peppery and a bit bitter. This pork was earthy, tender, with enough fat to make the burrito really luscious and to make me cringe when I had to track my points in my Weight Watchers app. I didn’t care for the crunchy, but flavorless, slaw served on the side – that felt like a wasted opportunity to add some freshness to the plate, but I loved the roasted tomato salsa on top, which was smoky with chipotles and just mildly spicy. 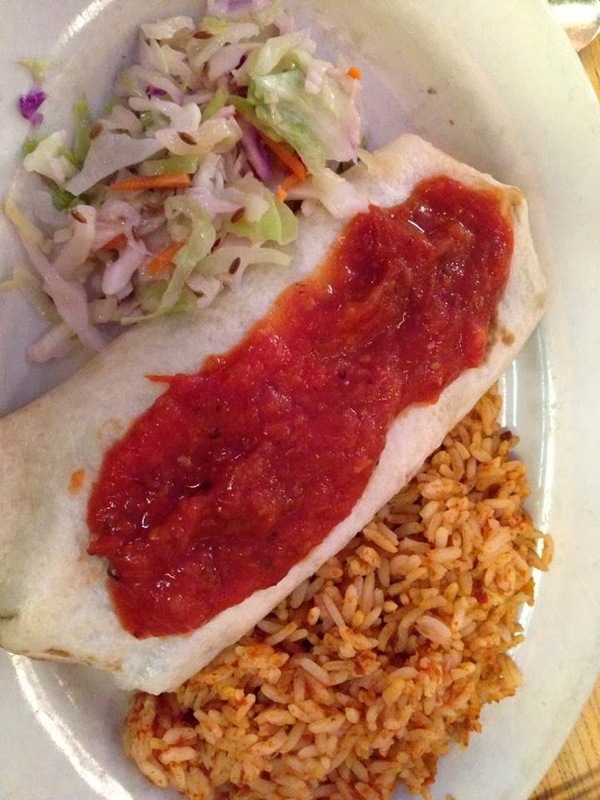 The Spanish rice on the side was fine, not the best I’ve had, and not the worst. I honestly wish more Mexican restaurants would go in the direction of a “green rice,” laced with cilantro and green onions, rather than the insipid, timid, mildly spiced, tomato paste-enriched Mexi-rice you get everywhere. Or even a true yellow rice, though that’s more Puerto Rican than Mexican. But no matter, because this was better than Taco Hell or some other chain place. So eat some! My Dad and Jill both ordered the fish tacos, which were made with a Hawaiian fish, wahoo. This was a nice, dense, satisfying fish, and much less flaky than what you usually get in a taco. I liked the lime-chipotle crema on these, and that they had slaw on them rather than lettuce and tomato. 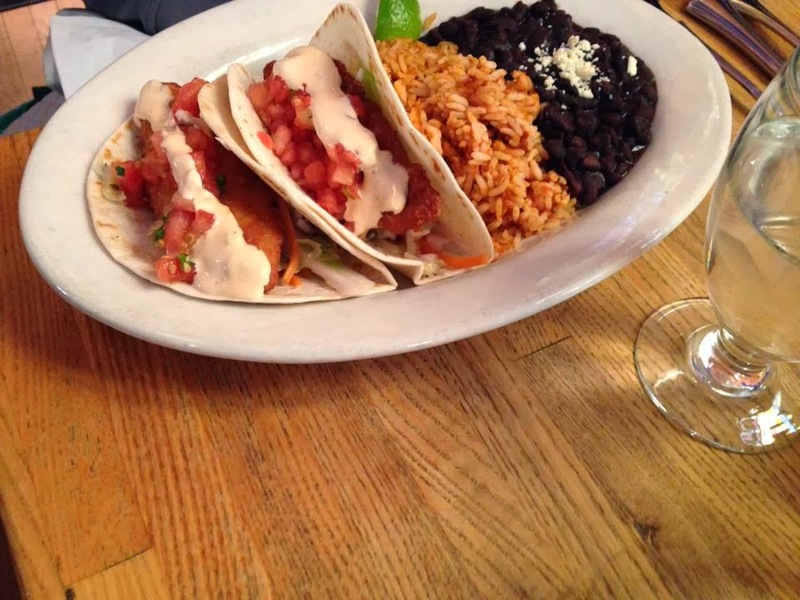 Fish tacos demand slaw, but here on the East coast, restaurants don’t always get that right. Mom had the breakfast burrito, and raved about it. I didn’t snag a bite, but if you’ve read BHS for any length of time, you know Susie Q has a pretty conservative palate, and was reluctant to commit to Mexican brunch. 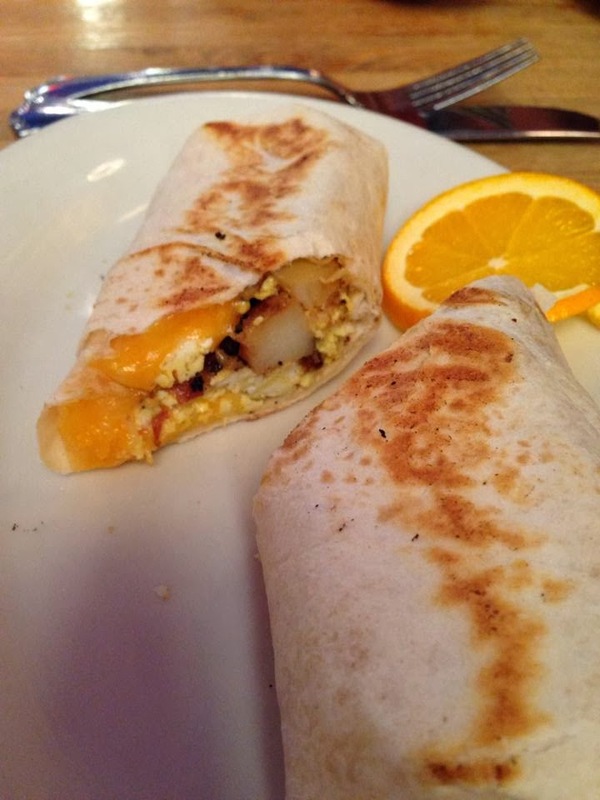 She ordered her burrito sans salsa, and she loved the slightly crispy, fried potatoes shoved into that egg and cheese wrap. Next time, I will pay more attention, and try to talk her into some mild pico de gallo on the side, but she was so happy with what she got, I’m not sure she’ll be receptive to my pitch. For dessert, I was hoping to find churros on the menu, and would have ordered them with a Mexican hot chocolate. Churros are the fried dough of Mexico, a bit denser and drier than Italian fritos, and dusted with cinnamon sugar rather than powdered. Alas, Mission failure, no churros to be found. 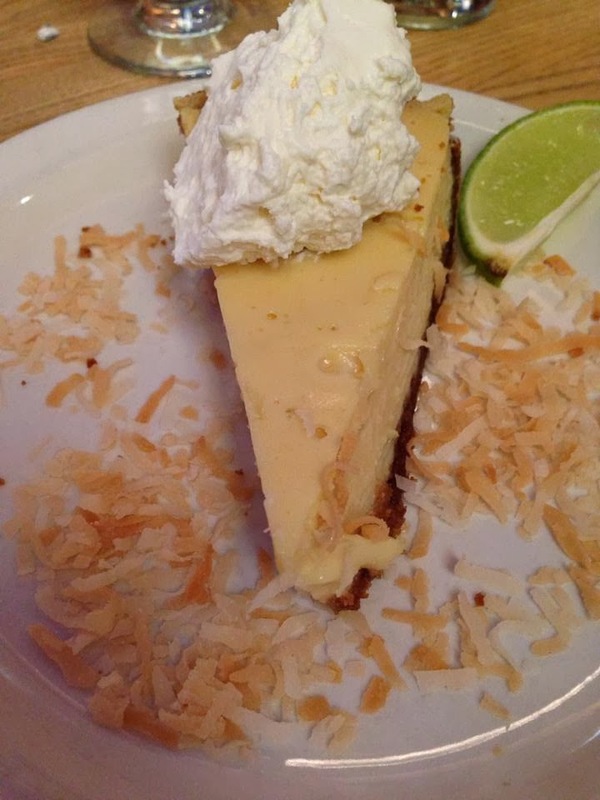 Instead, I took our waiter’s recommendation and got the tequila lime pie, which I quite liked, despite the lack of any real tequila flavor. It was tart, just a bit sweet, and very creamy. The crust, ostensibly a graham cracker base, but possibly jazzed up with some gingersnaps or vanilla wafers, was gangster. I think they put a bit of salt in it, too, or used salted butter to make it, which was smart. It added complexity to the dish that otherwise would have been lacking. The tequila should have brought that to the table, but again, I couldn’t taste any. And my tequila detector is pretty finely tuned, if I must say. I liked The Mission, and I would go back. Some of the dinner entrees look really interesting, and there’s a pork belly appetizer, plus, eating in a Mexican restaurant and not having a margarita seemed wrong. It’s weird to me that I’ve never heard of anyone I know in Syracuse talk about eating there, so I’m wondering if it’s not a bit of an undiscovered gem. I give The Mission a six on the BHS scale, and if I gave half scores, it might even be a 6.5. While the food didn’t knock my socks off, it’s a lot better than anything we’re getting these days in the Binghamton area, and we all quite liked most of our food. If they could get a properly working furnace, improve the level of service a tiny bit, and put a little more effort into the side dishes, this place could be off the charts. Ole! I love a good mexican meal. I often eat breakfast burritos at work that I freeze. Your mom's looks good, it would be great with pico de gallo. I think these are called the ahole days of winter. We moved to Syracuse last summer & I've been enjoying your blog and reviews of local places! We've been to the Mission twice now (for dinner) and have really enjoyed it. I feel like they have a more interesting take on Mexican than your standard Papa Gallo-type place. I had some butternut squash, black bean and something else enchiladas with a chipotle crema last time and they were delish. Thanks for reading, Bebelala! 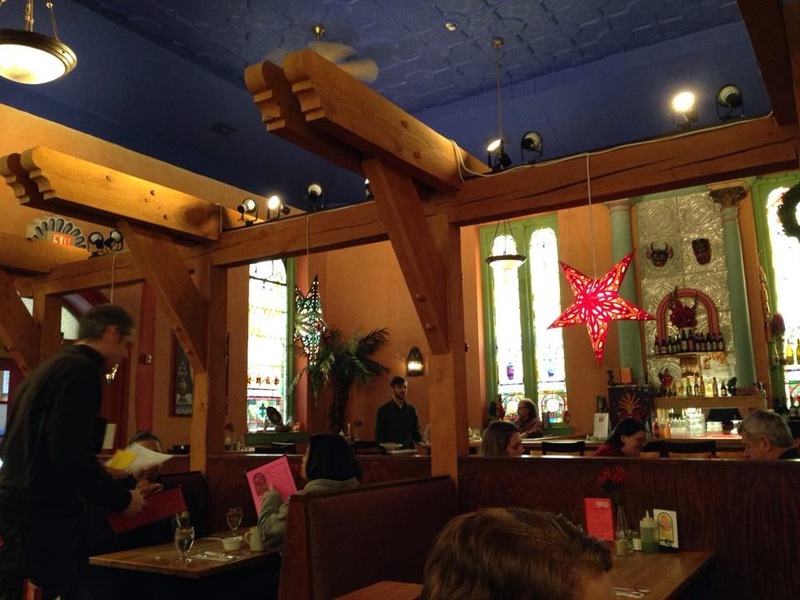 I'm glad my blog has helped you find some good eats in Salt City! I need to grab dinner at The Mission, but I also love Pastabilities, BC Restaurant, Bistro Elephant, and of course, Dinosaur. I have reviews of all these joints and more in the archives!